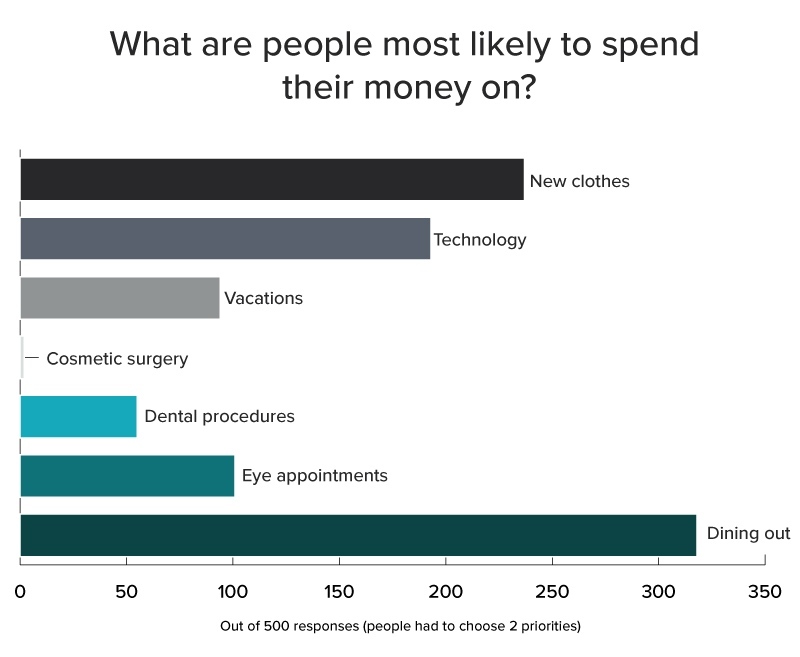 A survey carried out by STAAR Surgical, makers of the Visian ICL shows that people are prioritizing spending money on a range of non-essentials before eyecare, with 64% of respondents saying eating and drinking out is what they are most likely to spend their money on. Clothing came in second place, with half of the population more likely to splash the cash on a new wardrobe rather than visiting an eye doctor or prescription glasses. Technology is also a priority for 4 in 5 Americans, with 39% saying the latest gadget would be a more likely purchase than eyecare. The availability of the eye doctor was also a key reason, with 1 in 3 Americans not able to secure a convenient time for an appointment. Perhaps most worrying, nearly a quarter of respondents (23%) say they just don’t find eye appointments important. The amount of time it takes to secure an appointment could be one reason preventing people from attending them, with 1 in 5 respondents saying they often wait a month or longer for an appointment. 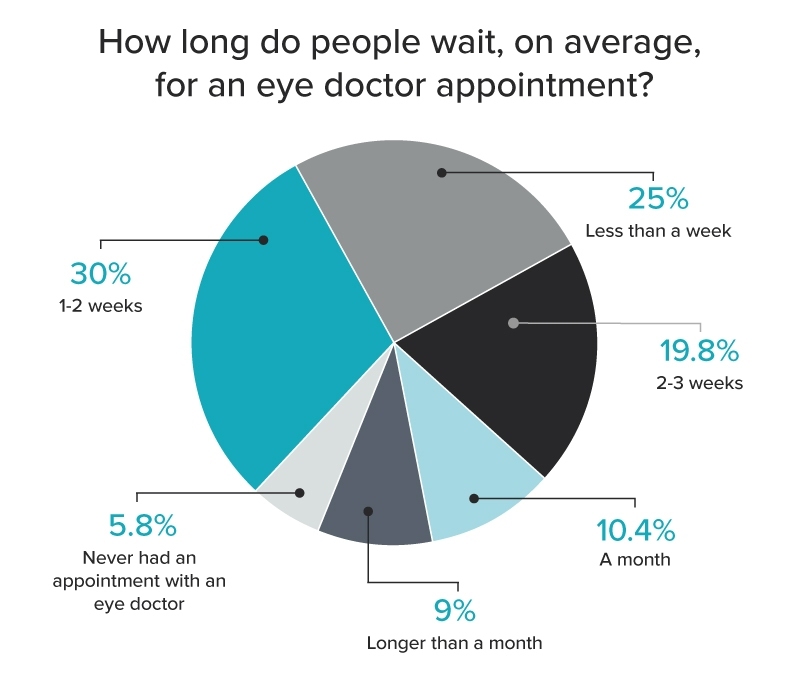 Half of those surveyed said they wait between 1 and 3 weeks for an appointment on average, with only 25% of Americans able to have their vision checked in seven days or less. Encouragingly, the majority of Americans aim to have their eyes checked at least once a year, with 56% saying they will book an appointment regardless of whether they feel their eyes need to be checked. However, 4 in 5 people will only do so if they feel that their eyesight has gotten worse, despite eye doctors often being able to spot several vision problems before they become clear. 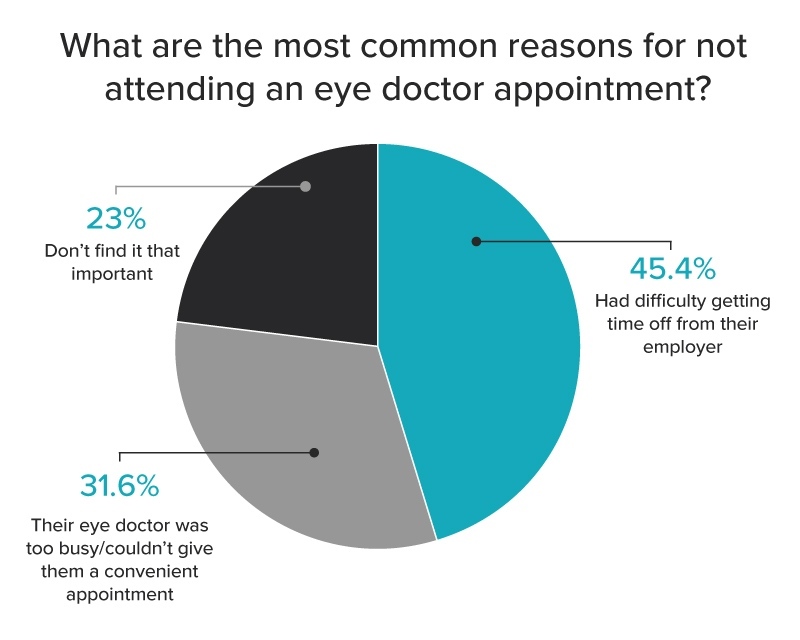 Location could also be a key factor in people being likely to attend an eye appointment, with some areas having a much greater concentration of eye doctors than others. For example, we analyzed data from the Bureau of Labor Statistics4 and Census population data5, which concluded Washington, D.C., has 29 doctors for every 10,000 people living in the city. 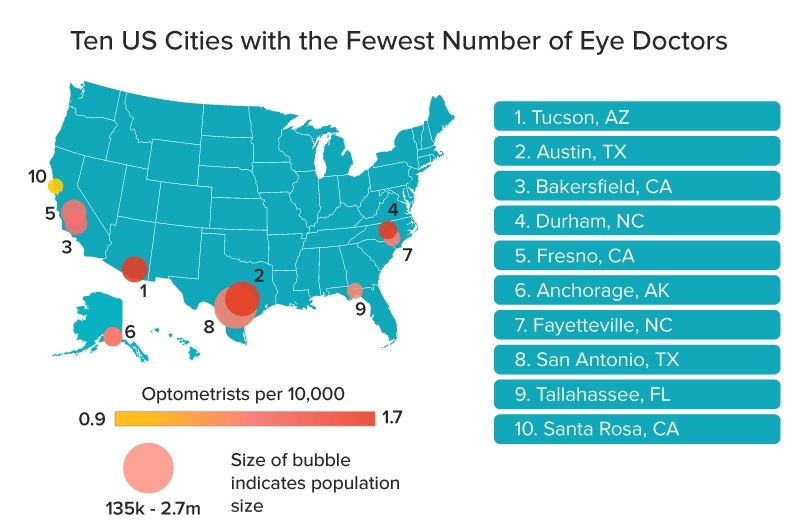 Conversely, Tucson, Arizona, has fewer than one eye doctor per 10,000 citizens. 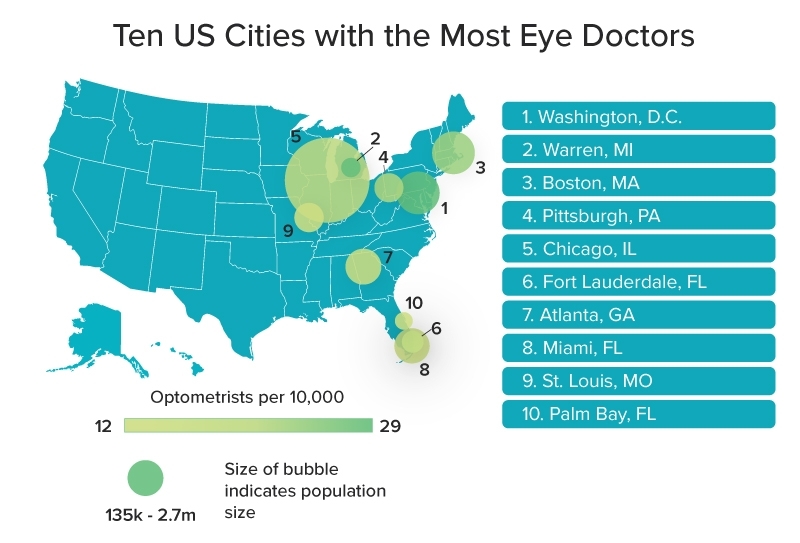 Access to eyecare appears to be a barrier to many Americans visiting an eye doctor, although eye health still ranks above dental health in terms of importance. While just 20% of respondents would spend their money on eyecare, only 11% would spend it on dental procedures. With eyecare also edging above vacations (19%), it certainly holds value among those surveyed, but there appears to be a long way to go before eye doctor appointments become a necessity for many Americans.